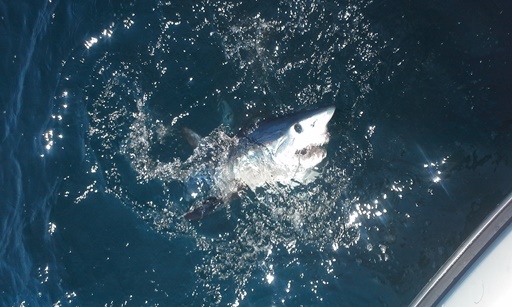 New England Sharks from On The Water TV on Vimeo. Near shore or off shore fishing for black sea bass, scup, flounder, taug, striped bass, bluefish, albies and bonito to offshore targeting sharks, bluefin, yellowfin and mahi with a mix of pollack, haddock and cod. Enjoy your day of fishing with Capt. Mike Pierdinock, USCG Licensed Master aboard the "Perseverance" a 30 foot Pursuit 3000 Offshore with twin diesel engines, marlin tower, outriggers, restroom and bunks. The "Perseverance" departs from the New Bedford area and depending upon the target species will fish the Buzzard Bay, Vineyard/Nantucket Sound waters and offshore prime fishing grounds south of Nantucket and Marthas Vineyard. Upon request we can also fish the Cape Cod Bay and Stellwagen waters. Contact us now to plan and schedule your trip at (617) 291-8914. CPF Charters specializes in corporate clients and provides all of the fishing gear necessary for your trip, even though you are welcome to bring your own. At your request, your charter can include the food and drink necessary for your entire trip. Photographs in electronic format will be provided and forwarded to you soon after your charter. We can also record your fishing trip and provide you a lifelong memory of your catch. If requested, the 1st Mate can clean and fillet your catch. Nationally televised on the NBC Sports Network "Quest for The One" as well as shark fishing on On The Water TV and ABC WCAB Channel 5 "Chronicle" and other TV and radio interviews and footage associated with the "Perseverance Team" tagging a 16 ft Great White Shark at the Monster Shark Tournament. Click Here for MORE Great White Shark Footage! The "Perseverance" team tagged a 16 ft Great White Shark at the Monster Shark Tournament, see the video above!